Occasionally, McDonald’s offers a series of food products that involve a theme, such as the “Great Canadian Taste Adventure,” which featured food products inspired by Canadian dishes. This time, they are offering a challenge where they add a kick to the McChickens by using various spicy pepper flavours. Since I like spicy food, I accept their challenge. 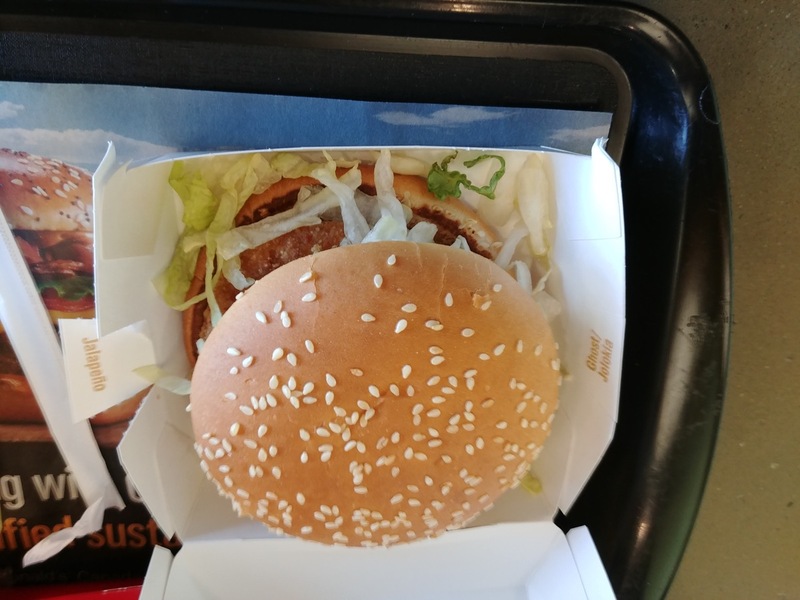 Every two weeks, McDonald’s will offer a different McChicken with a different sauce that is centred around one specific pepper flavour. This campaign will go on until March 11. It is not yet known if the fast food giant will change the sandwiches every two weeks or if they will phase the new ones in to make them all available concurrently. This series will contain three different types of McChickens with different heat levels. First, we have the Spicy Jalapeño McChicken, which is the McChicken with a jalapeño-based sauce. It looks like the McChicken except that the sauce has jalapeño pieces and is a bit more flavourful than the McChicken’s standard mayo. Despite the “Spicy Jalapeño” name, it is not very spicy at all—being the mildest out of the three burgers in the series. It does have a kick but it should be easy to eat. Due to that mildness, I did not make the “spice face” that the advertisements challenge you against. I guess I won this round. With one sandwich done, it is about to get spicier with the next two sandwiches—a McChicken with habanero and a McChicken with ghost pepper, set to launch on February 12 and 26 respectively.